During the Memoire des vins Suisses weekend some of the time was taken up by official meetings of the winegrowers involved. So on a rather misty Saturday morning Sam and I, who would otherwise have been at a loose end, were picked up by the charming wife of Louis Bovard who drove us to her domaine for some vineyard visiting and wine tasting. 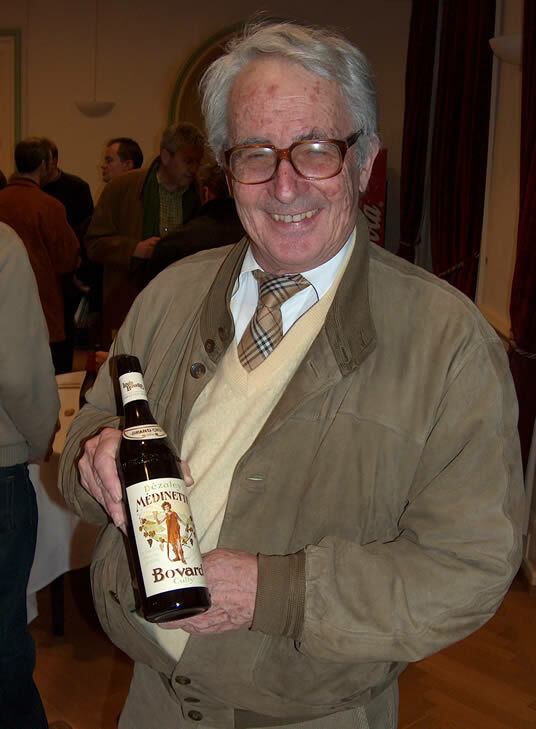 Bovard is one of the few Swiss producers whose wines I’d some previous experience with: the Médinette from Dézaley had been a nice surprise when it was served to me by my brother in law who lives in Geneva: a really attractive, rich rounded white. Bovard have 17 hectares spread across some smart vineyard sites bordering Lac Lemain. They also make 17 different wines. 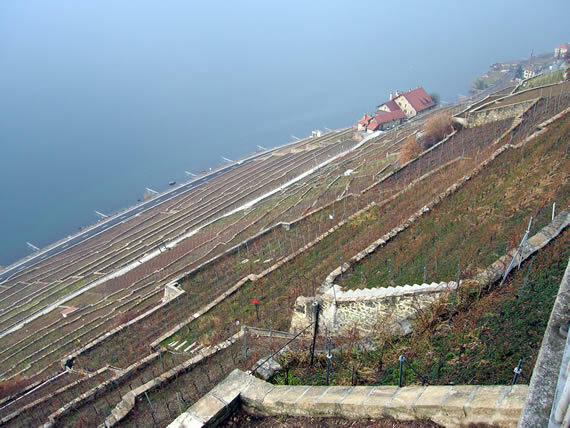 Before visiting the winery we were given a tour of the Dezaley vineyards, which are spectacularly located on the steeply rising bank of the lake. Growing grapes here is highly labour intensive and reasonably dangerous. 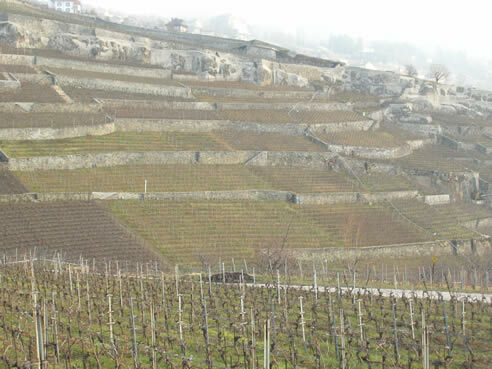 Some of the terraces are just wide enough to take a single row of vines (pictured below). Some biodynamics is practiced here (roughly 30% of the vineyards). This has been going on for five years. There was some evidence of the damaging July hailstorm that all but wrecked the 2005 vintage here, with scarred wood on the vines. In the winery, most of the work is done with 8000 litre foudres. A bit of battonage is used. Annual production is around 200 000 bottles and the wines are fantastic. We began the tasting with cask samples of the 2005s. The wines are Chasselas unless otherwise noted. Closed nose. It’s on its lees. Rich and ripe with nice fruit, good weight and low acid. Really full, spicy, fruity nose with some fatness. Lovely acidity and nice expressive character. A potentially brilliant wine: it’s a shame 90% of crop was lots to hail. This will be 70% of the Salix; the rest is Chasselas. Lovely full, herb-tinged spicy nose. Quite rich. Dense palate with good weight, richness and acidity. Lovely fruit. Fantastic. This is one of Bovard’s two Sauvignon Blancs; the other one is Ribex. They are tremendously successful and highly sought after. Lovely rich spicy nose is full and quite sweet with a grassy edge. The palate is fresh but full with lots of nicely textured fruit. Delicious and quite brilliant. This is pre-malolactic fermentation. After fermentation the wine is chilled down without any sulfur dioxide addition to let the ethanal to form cross links with the anthocyanins and tannins, thus fixing the colour. Just thought I’d share that technical gem. It has a wonderful pure, perfumed nose of bright blackcurrant fruit. The palate is ripe and fresh with lovely fruit and nice typicity. This will be blended with the Shiraz (below) to make the Bovard Rouge. Lovely nose of fresh, vibrant red fruits with great freshness and some northern Rhône-like violet character. The palate is open and bright with lots of fresh red and black fruits. Nice savoury spiciness. This was harvested on 4 November!